are holding a special event in Sydney on Monday 20 August 2012. An event that reveals the sordid details behind the allegations surrounding Julia Gillard, Bruce Wilson, and Ralph Blewitt – and how the government tried to stifle free speech and suppress this story. Late last year, Michael Smith, the host of Radio 2UE’s afternoon show, was set to go on air with an explosive story. He had the detailed facts behind allegations of Julia Gillard’s involvement in corrupt activities by her then partner Bruce Wilson and his accomplice Ralph Blewitt. Activities that make Craig Thompson look like a saint in comparison. It was cleared by lawyers, by producers. The facts were all confirmed. 10 minutes before he was to go to air, the story was pulled and Michael Smith lost his job. Listen to Alan Jones interview Michael Smith here. That very day, The Australian newspaper reported similar allegations. 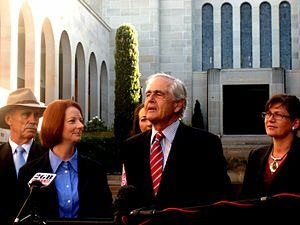 Julia Gillard herself phoned News Limited CEO John Hartigan, and demanded that the story was retracted, and that “News Ltd give her an undertaking that it would never again report in any way on websites or in its newspapers on this matter.” Senior Journalist Glen Milne was sacked, and Andrew Bolt ordered to never speak of this again. But the truth can’t stay buried forever. Free Speech can’t be suppressed. Two weeks ago, Mike Smith had an interview with Alan Jones and spelled out in great detail not only what he learned – but the attempts by the government to silence it. A few days later Ralph Blewitt came forward and said he’d be willing to testify in a court of law – if granted immunity. THIS IS THE STORY THE GOVERNMENT TRIED TO KILL. THIS IS A STORY THAT ALL AUSTRALIANS MUST KNOW. That’s why the Australian Taxpayers’ Alliance has just arranged for Mike Smith to make a special address in Sydney detailing in full the truth behind this case – and the shameful attempts by the government to stifle any reporting on it. This is our chance to hear from Michael Smith himself – and learn all the facts. If you are in Sydney, or able to make it to Sydney on Monday the 20th August 2012, I hope you will be able to join Michael Smith for this very special event. To book your ticket for $15 click this link to the Australian Taxpayers’ Alliance to reserve a place. This entry was posted in News Archive and tagged Alan Jones, Andrew Bolt, Australia, Australian Taxpayers Alliance, Bruce Wilson, Craig Thompson, Glen Milne, John Hartigan, Julia Gillard, Michael Smith, Mike Smith, News Limited, News Ltd, Ralph Blewitt, Sydney, The Australian newspaper by renaissancelearningfoundation. Bookmark the permalink.